Having traveled in 45 US states for a total of over a year and a half, Arizona is one of our favorite states to visit! It combines that sense of adventure of all things West, with spectacular desert scenery that’s second to none. 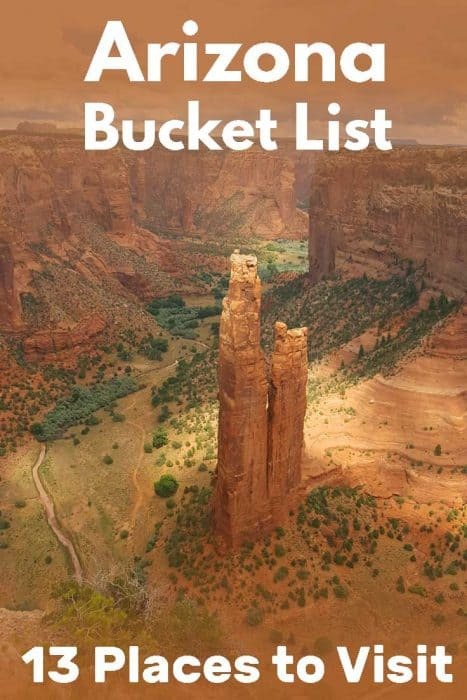 Today I want to share with you my own Bucket List for The Copper State. We have visited most of the places in this list. The ones we didn’t visit are definitely on my own personal Bucket List of places we will visit in the future. 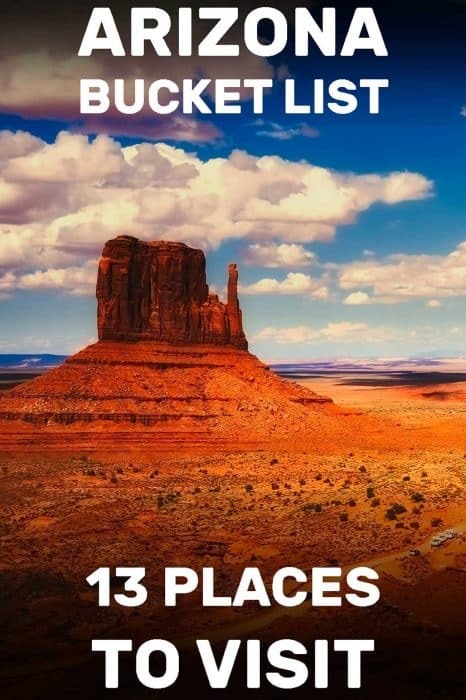 Without further ado, let’s review those 13 places everyone should see in Arizona before they die! Everyone knows what the Grand Canyon is. Thousands of years of erosion within Arizona’s characteristic red rock have formed the deep and multi-faceted attraction that has long been considered one of the natural wonders of the world. The Grand Canyon is widely regarded as Arizona’s singularly most famous landmark. You can enter the Grand Canyon National Park via the South Rim or the North Rim (keep in mind the North Rim is typically closed during winter). 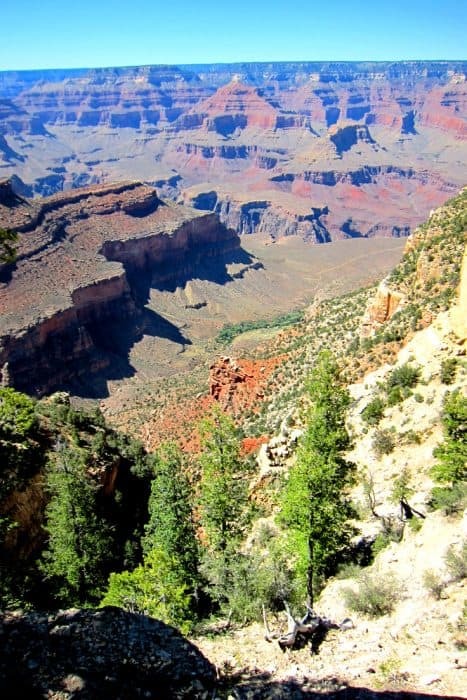 Guests can access the West Rim of the Grand Canyon by traversing the Hualapai Indian Reservation. Once you get here, any first-time visitors with you may be astounded at how much there is to do at the Grand Canyon in Arizona. Hiking, rafting, tours on the land and tours from the sky are all possibilities that can enthrall you for a full day – or more if you’re staying to camp. Children in your traveling party can even become junior rangers during your stay. This affords children the exciting opportunity to learn and see more of the Grand Canyon’s awe-inspiring sights. Also known as “Corkscrew Canyon,” Antelope Canyon is a breathtaking slot canyon located in the Lake Powell area. near the town of Page. Few formations in the American Southwest garner as much attention and photography as Antelope Canyon. Located on Navajo land and formed through the erosion of the native sandstone in the region, Antelope Canyon consists of an upper and lower level. Both areas are available for the public to visit. Visitors have praised Upper Antelope Canyon as a leisurely, scenic stroll that grants incredible views of the surrounding Navajo lands. The walk is flat and easygoing but still affords many opportunities for getting a great picture. 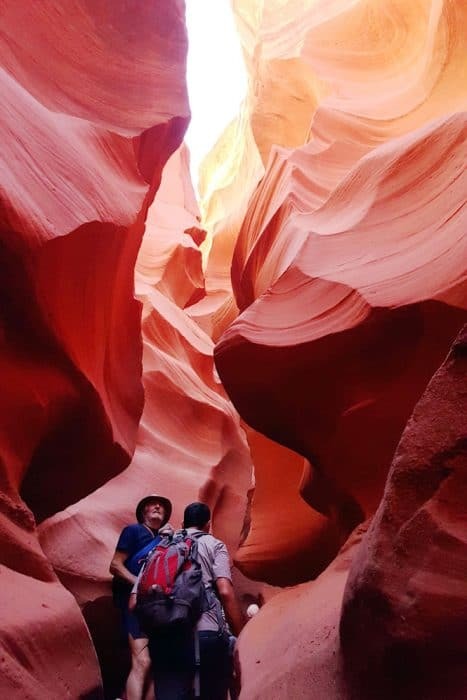 Traveling as a family, we hiked Lower Antelope Canyon. While not wheelchair-accessible due to staircases and narrow passages, overall it wasn’t a difficult hike at all. You can read more about our experience and see the pictures in my Guide to Antelope Canyon. The Apache Trail, or AZ 88, is a 120-mile trail that routes through the Superstition Mountains. On one end of the mountains lies Apache Junction while on the other sits Theodore Roosevelt Lake. The Apache Trail connects these two landmarks through the mountains with a completely unique and breathtaking scenic view. Winding and unpaved roads mark much of the trail, though that doesn’t stop thousands of visitors a year from enjoying the drive. 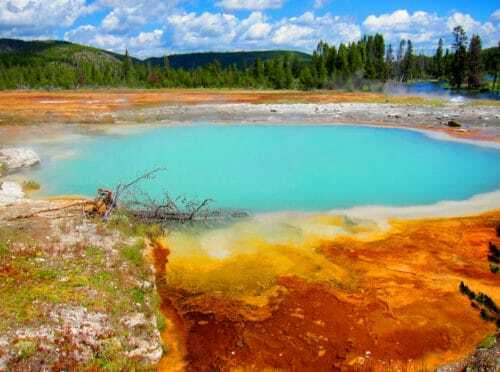 The view of the mountains, stunning forestry, and lakes of the deepest blue make for an experience, unlike anything you could experience elsewhere. That being said, there are many areas wherein large vehicles, such as RVs, are not ideal for driving along the trail. Also, if you rent a vehicle, you probably won’t be insured for going off-road. That’s why we haven’t done the Apache Trail. Yet. When the Apache Trail becomes steeper, you will pass along Canyon Lake. This lake is dry much of the year, but when it isn’t there are visitors aplenty. Canyon Lake is also a great spot for those with a love of desert vegetation and the beauty of Arizona’s desert. Right after the AZ 88 turn-off lies Goldfield. This area used to be a ghost town but has now become a highly commercialized center. It is home to the Mammoth Gold Mine, the Goldfield Museum and many other attractions. You can shop, pan for gold, or witness a gunfight held between two old west gun-slingers! 40 miles east of Phoenix and rife with beautiful desert scenery, Lost Dutchman State Park is a treasure trove of possibility. 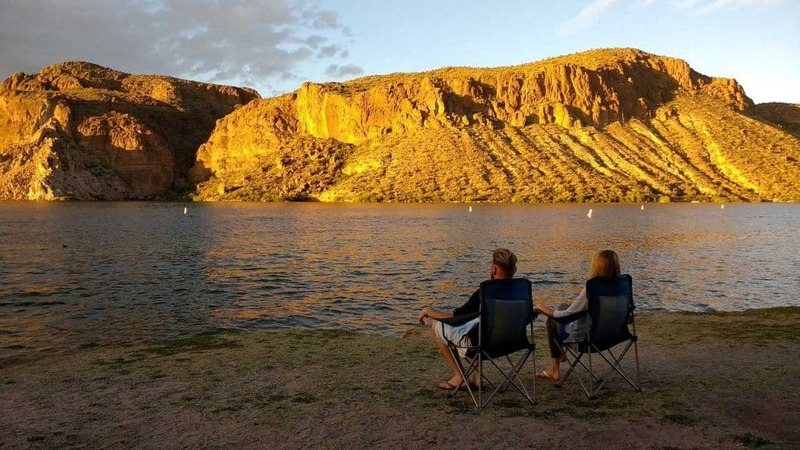 The state park was named after a fabled lost gold mine and is now one of the most popular camping spots in Arizona. If you’re lucky enough to visit during the rainy parts of spring, you may even see native desert wildflowers. It took millions of years of natural formation for Canyon de Chelly to become what we know it as today. Up until the mid-1300s, the area was populated by the Puebloans, who sought the natural protection and sunlight of the canyon. 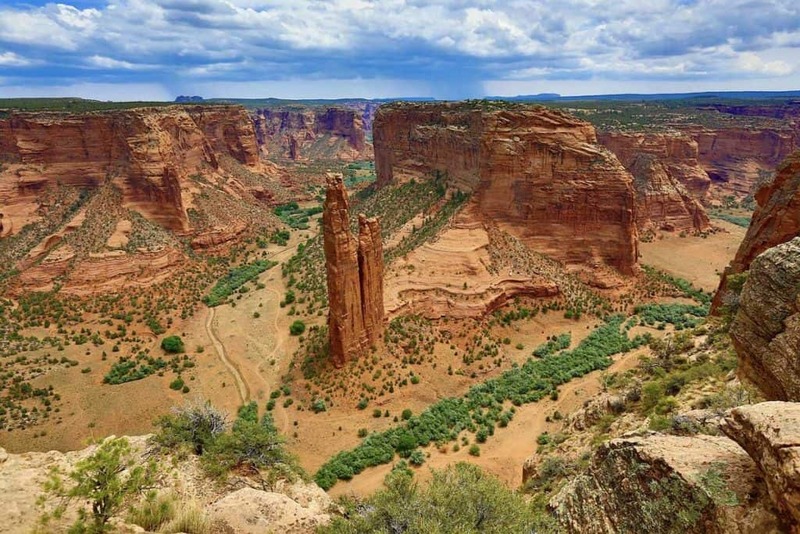 Canyon de Chelly is a National Monument that consists of 84,000 acres – all residing on Navajo land. It is home to 40 families of the Navajo Nation, which works in conjunction with the National Park Service to protect this historic land. The area inside the canyon is holy tribal ground, so you can’t hiking there, at least not without a Navajo guide. So, while the canyon itself is totally spectacular, you’ll only be seeing it from the canyon rim drive. Or rather drives (as you can drive along the northern as well as the southern rim. We drove the southern rim last year and it was stunning. What we also did was to check out the Visitors Center. They had an interesting display of tribal artifacts as well as a mud structure that shows you what traditional Navajo life was like. 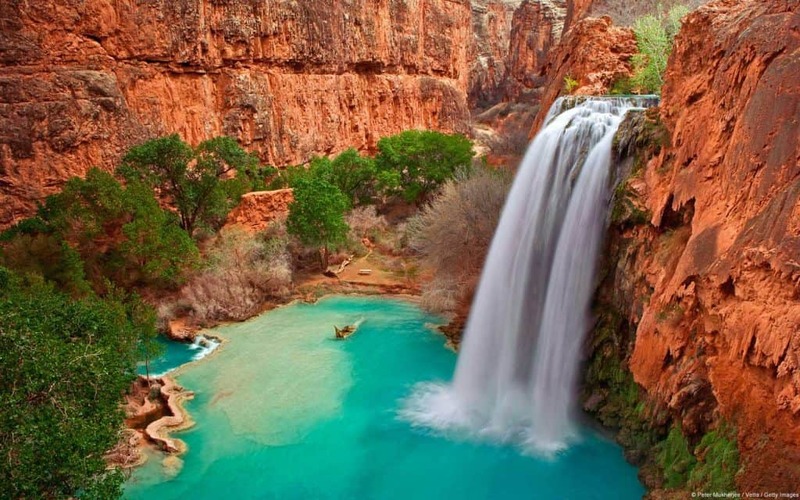 Located within the Havasupai Indian Reservation are the Havasu Falls, easily one of the most beautiful places within the continental United States. Possibly the world. Sandy beaches, cottonwood trees, and vibrant blue waters make for a scenic spot that any lover of nature will enjoy. Truly, it is an oasis in the desert of Arizona. Because the untouched beauty of this place is so staunchly preserved by the area natives, getting to Havasu Falls can be quite a tricky experience. Reservations must be made online and paid in advance when the reservation is made. There is no day hiking allowed within the canyon that contains Havasu Falls – period. Hiking the 8 miles from Hualapai Hilltop to Supai Village, and then hiking an additional 2 miles to the Falls. Horseback or Mule rides are available for an added cost, for those who aren’t keen on hiking. A helicopter can deliver visitors to the Falls on a weather-dependent basis. Helicopter rides to the Falls are $85 each way, with children under 2 flying free. You cannot reserve a helicopter transport. Upon visiting, make sure to have your ticket receipt with you. There are various checkpoints along the path, where you will be checked to make sure you have paid for the right to visit Havasu Falls. Located on the Colorado River and between the borders of Utah and Arizona lies Lake Powell. 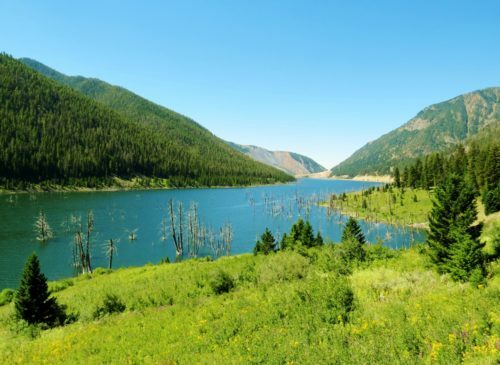 The 254-square-mile reservoir is a popular visitor’s attraction with over two million guests enjoying its beauty every year. 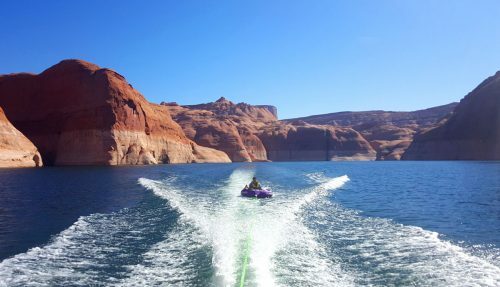 If you take one look at the crystal-clear lake, surrounded by a backdrop of canyons and desert beauty, it won’t be hard to see why this is such a popular place to be. 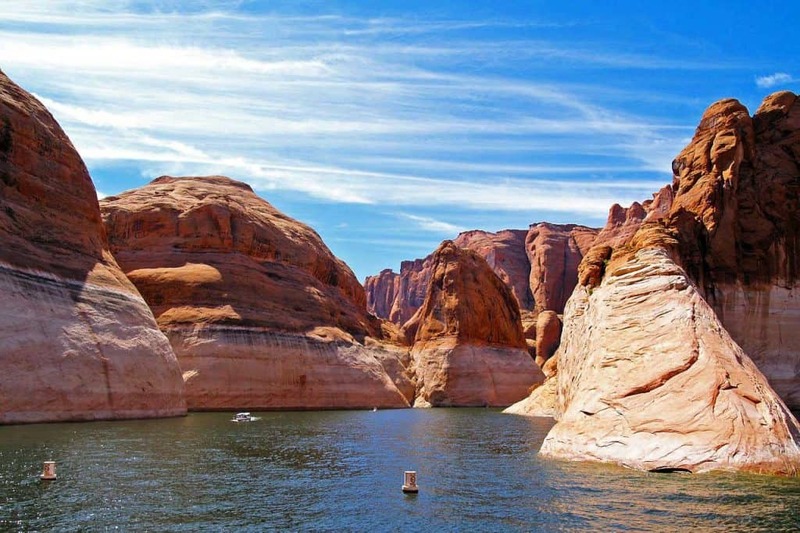 One of the most notable features of Lake Powell is the Rainbow Bridge Monument. The iconic stone arc is accessible via tour boats and private boats alike. Before Lake Powell became the full reservoir that it is today, it used to require a long and arduous hike to see this breathtaking monument. Take a cruise to get to Rainbow Bridge Monument. Rent a boat or a kayak and explore the lake on your own. We chose the second way and it was totally fantastic. We rented a boat for six from Antelope Marina for half a day and had a blast shooting through the water. We entered one of the canyons and took turns driving the boat in the narrow pathway. We also rented floating tubes and water skis and the boys enjoyed getting dragged behind us. On the border between Arizona and Utah, characterized by impressive buttes, is one of the most iconic regions of the American Southwest. We’re talking about Monument Valley, a site that has been host to many media formats since the 1930s. 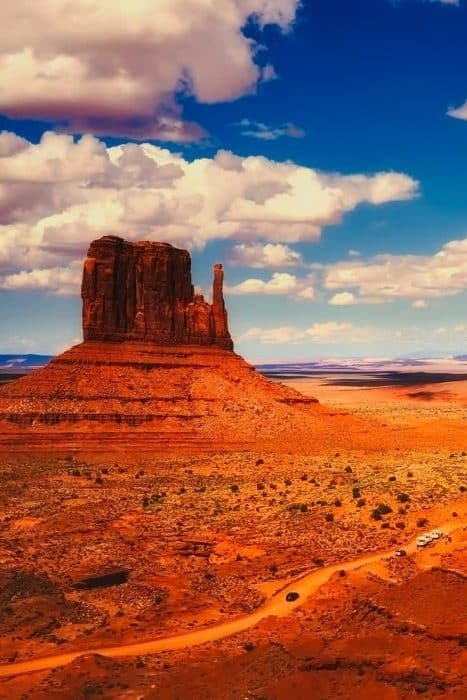 Monument Valley has been intrinsic to the cultivation of what generations believe the Southwest to be for this reason. This large area encompasses much of the Monument Valley Navajo Tribal Park, which may be accessed after paying a fee and driving through a portion of the park. Like some other areas of Arizona protected by the Navajo Nation, there are some locations within Monument Valley that cannot be accessed without an authorized guide. There are many types of guided tours available for guests of the valley. Lodging can be found at the View Hotel or at one of the many campsites in the valley. 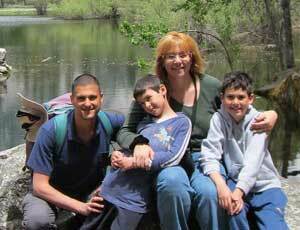 Wildcat Trail is a fantastic experience for hikers who want to see the best views available from a hiking excursion. 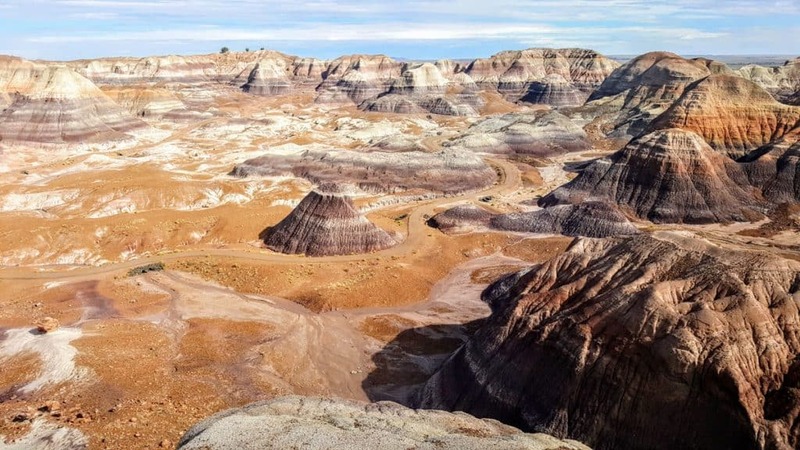 In North-eastern Arizona and across both Navajo and Apache counties, the Petrified Forest National Park stands as a testament to the beauty that petrification can cause to a land. At the gift shop, you can purchase pieces of petrified wood to commemorate your trip. But the real highlight of your visit should be seeing the petrified logs for yourself. These are the namesake of the park. Walk or drive through the park to get a great look at the natural surroundings of Petrified Forest National Park. There are many well-maintained paths that lead to spectacular overlooks and other natural features of the park. We visited the park in 2017. We were there at 7 when they opened the gates to the park road. We crossed from the southern entrance to the northern one, and in between stopped at various points for some hiking and picture taking. If you ever want to travel on Route 66, this section of the road is IMO your best option. And it’s in Arizona! Basically, this is a detour you can take from the I-40. 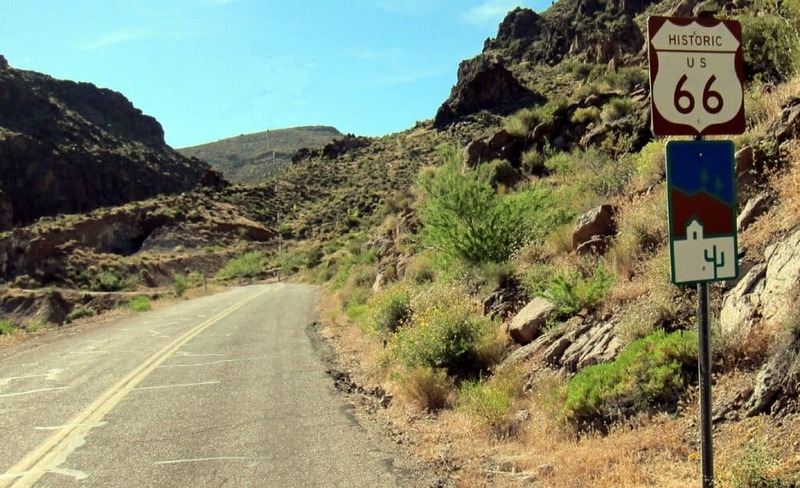 You basically leave the highway near one end – either at Seligman or Oatman and cross over in time to an alternative road section. Part of this route you’ll be driving through Sitegreaves Pass for stunning scenery. When we did that, we even saw a rattlesnake crossing the road! Half ghost town and half tourist attraction, Oatman is one of the most popular destinations on the entire route. This town used to be a thriving mining town during the gold rush; evidence of this fact still stands today. 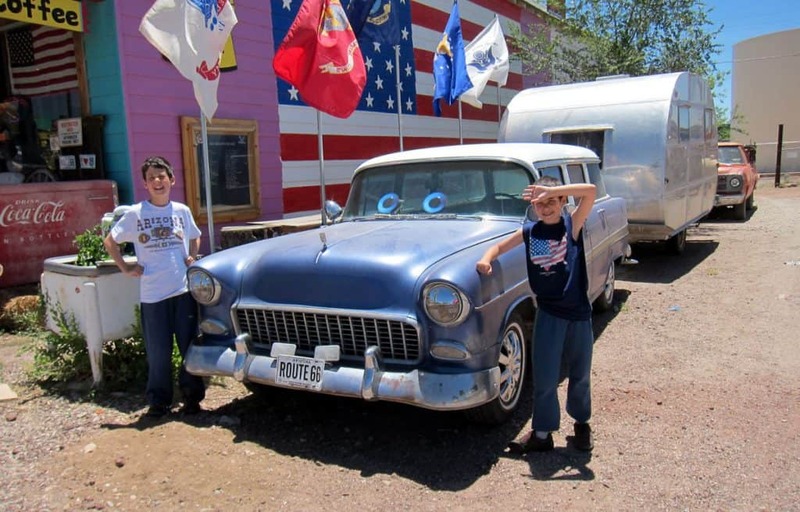 Walk past the slumping – but still standing – remnants of yesteryear with a visit to Oatman. The photography opportunities are one-of-a-kind. More than that, a trip to Oatman makes for an incredible educational experience about a former era in America. 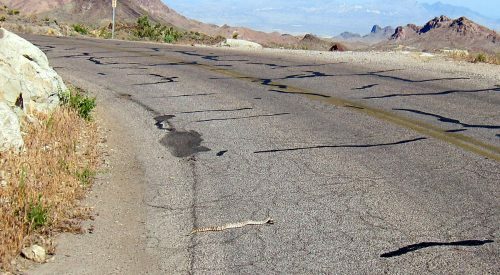 If you love anything (or everything) about the old west, Route 66 from Seligman to Oatman is a can’t-miss traveling experience. And if you’re lucky – you’ll see the famous donkeys as they go through town! Our kids were 7 and 9 when we visited and at the time, that was one of their favorite movies. We all had a blast visiting Seligman! 91,327 acres of land between the east and west of Tucson, AZ make up the Saguaro National Park. There are two named districts of the park – the Rincon Mountain District (east) and the Tucson Mountain District (west). 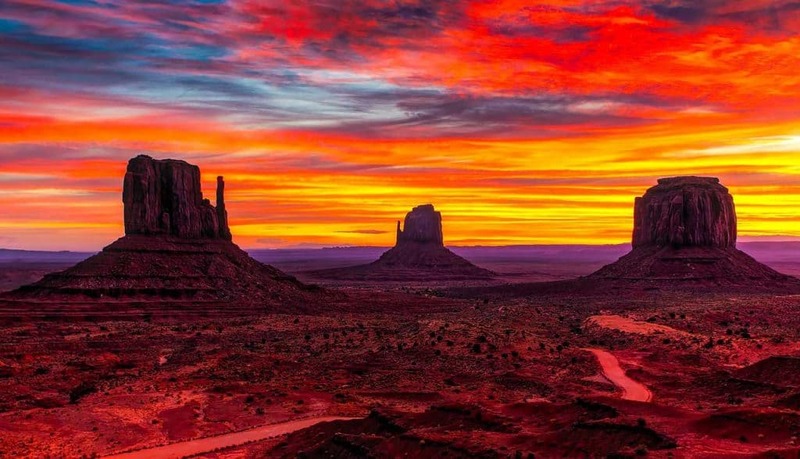 Together, the two districts form one of the most popular national parks in Arizona. The Tucson Mountain District is a great spot for family picnics, though you might want to visit during the Fall or Winter months to avoid the more oppressive heat of summertime. Hiking along the Valley View Overlook Trail is another popular pastime. This path takes visitors to a splendid view of the distant mountain ranges of the region, as well as the Avra Valley. For history and culture buffs, the western part of the park also features an orientation on the native’s beliefs toward the Saguaro cactus. This orientation occurs daily at the Red Hills Visitor Center. Another landmark of cultural significance are the ancient petroglyphs that are visible at the Signal Hill Picnic Area. The Rincon Mountain District to the east of Tucson also boasts numerous tourist attractions and exhibits. Most guests start their trip with a drive or bicycle journey along the Cactus Forest Loop Drive. This self-motivated tour offers guests a great view of the Rincon Mountains for which this district is named. There is also a single-mile loop hike along the Freeman Homestead Trail. This path gives visitors the opportunity to learn more about homesteading in the desert. You may choose from a number of other hiking paths as well. 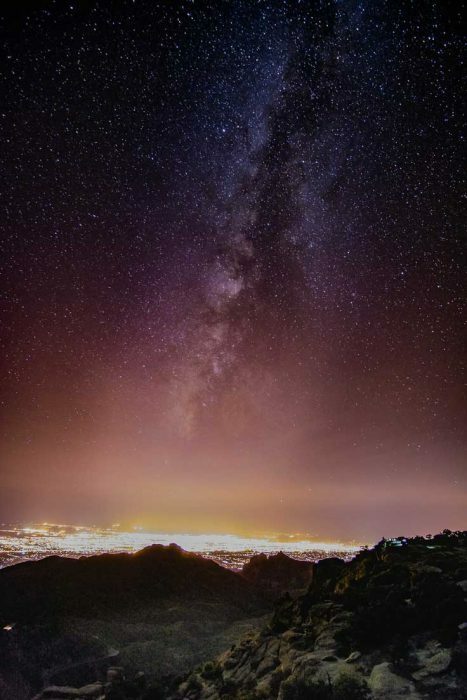 If you’ve got the time to spare, we recommend making a trip up to the Rincon Mountain Saguaro Wilderness Area. This out-of-the-way area features the Manning cabin, which was constructed by the former mayor of Tucson (Levi Manning) in 1905. Another iconic feature of the American Southwest is the Red Rock Scenic Byway that leads visitors into the town of Sedona. 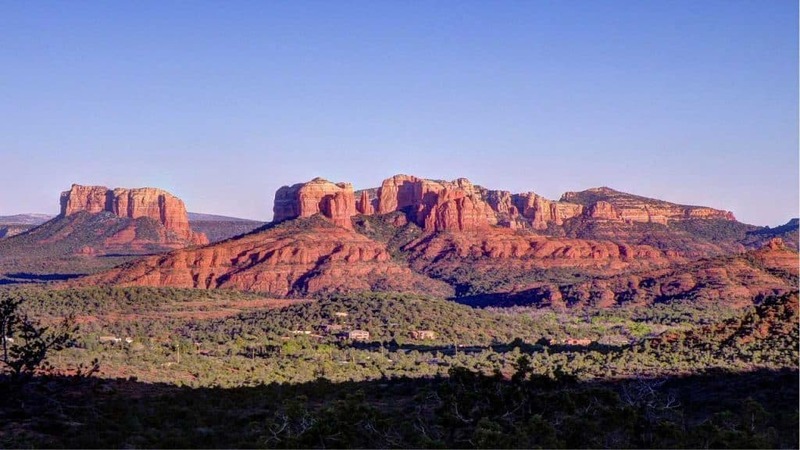 For absolutely zero charge, visitors can experience a world of first-time experiences and create lasting memories along the byway that leads into the red rock country that is known today as Sedona, AZ. 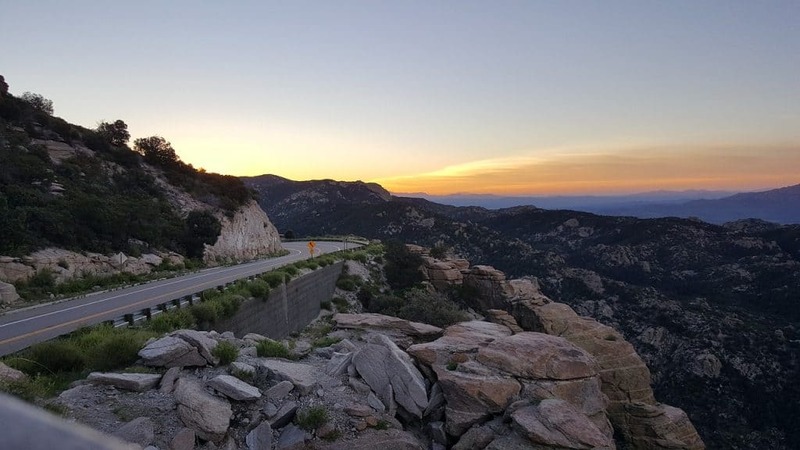 Also known as SR 179, the Red Rock Scenic Byway is a seven-and-a-half-mile drive that takes you through some of the most scenic areas of Arizona – all in a single straight shot. However, you’d be remiss to avoidd taking some of the exits that afford guests the best views from the byway. We recommend taking the scenic byway twice – once on each side of the road – to get the full experience. This way, you don’t have to miss anything! That’s what we did – and it was totally worth it! Sedona itself is quite an experience once you get there. With many attractions ranging from natural parks to shopping malls, there’s something for every visitor’s preference. 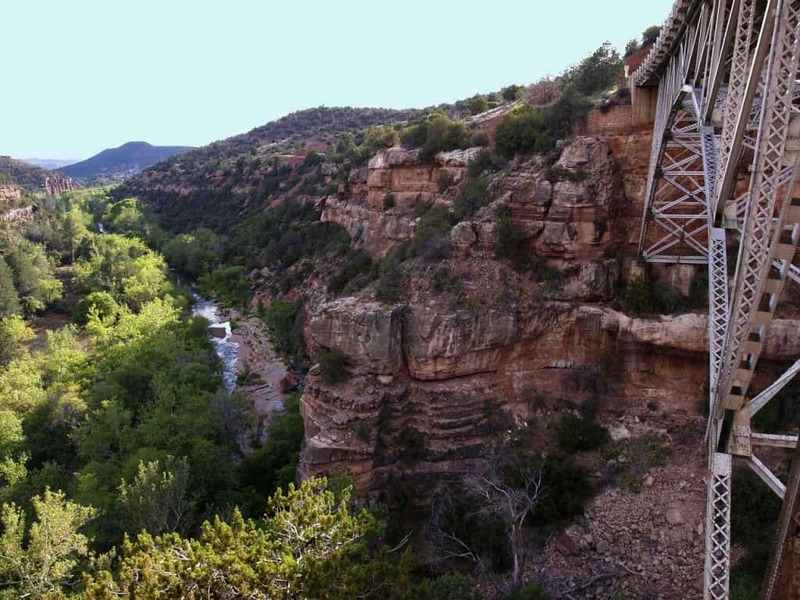 Taking the Red Rock Scenic Byway to Sedona makes for a great beginning to a wonderful adventure in Arizona. If you are visiting southern Arizona, either Tombstone or Bisbee – or both – should be on your Bucket list. 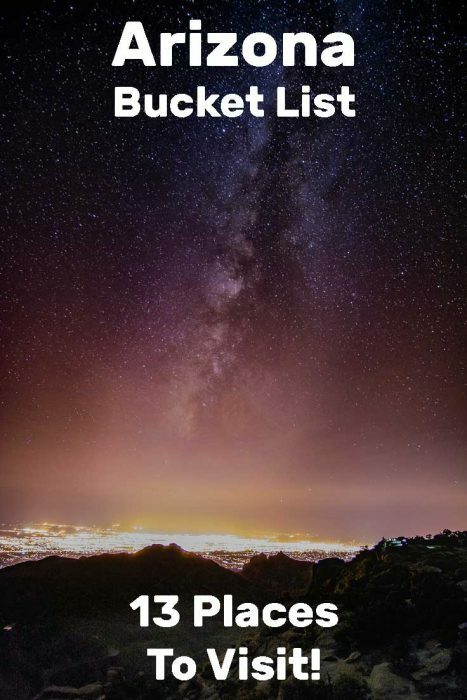 Bisbee is only a 90-minute drive away from the thriving city of Tucson and if you like, you can include both in a single day trip from the city. The Bisbee Mining and Historical Museum, perfect for a lover of the American Southwest’s more historical qualities. There are several charming eateries to enjoy, as well as comfortable lodging. In fact, Bisbee is known for having quite a few Bed and Breakfasts. A stay at one of these beautiful B&Bs will only enhance the quaintness of this tiny mining town. Do you remember learning about the gunfight outside the OK Coral in 1881? Tombstone was the site where this infamous shoot-out took place. As such, it has become an iconic figure in the American Southwest. One of the first things you’ll see upon entering Tombstone is the “Town too Tough to Die” sign. This is a perfect photo opportunity, so get in that selfie while you have the chance! Meander between 3rd street and 6th street to get an eyeful of the classic Old West. You can visit the famous OK Coral for a gunfight re-enactment, a thrill that most guests enjoy. After that, pay a visit to the town’s most famous saloon and gambling hall, the Bird Cage Theatre on Allen Street. The Theatre is still intact, standing as one of the few remaining pieces of Allen Street’s once-thriving red light district. It’s even been suspected that the Bird Cage Theatre is haunted! Ghost Hunters filmed an episode there in 2006 and the spooky story has become something of a modern urban legend. Before departing Tombstone, make sure to visit the Rose Tree Museum. It is here that you will learn everything there is to know about Tombstone. 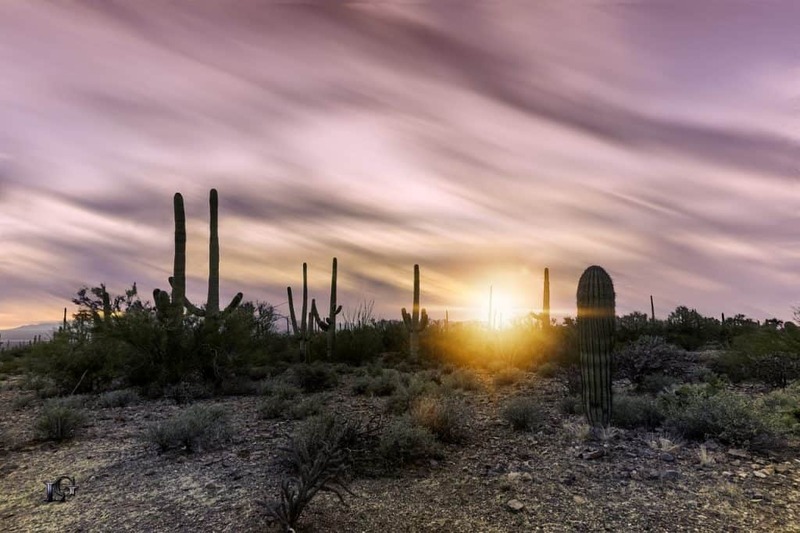 Surrounded by the Saguaro National Park to its east and west, Tucson receives thousands of visitors each year. All year long there is rarely anything other than sunshine, making Tucson a number-one tourist destination. Theater, dining, shopping and many other attractions await you in the city of over 500,000 residents. 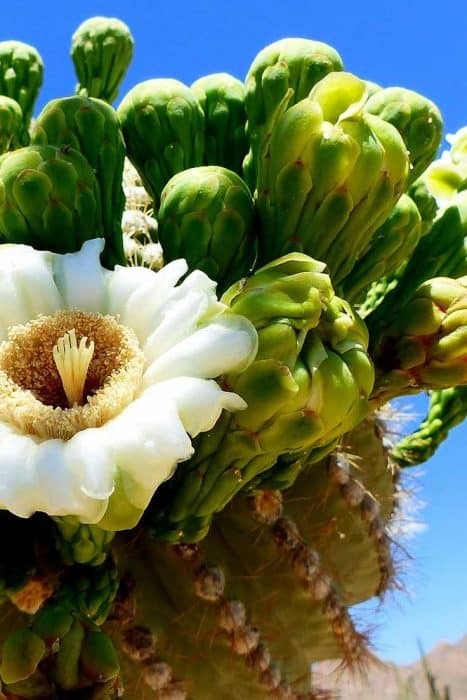 Out of all the attractions residing in and around Tucson, we encourage you to visit the Arizona-Sonora Desert Museum. This museum boasts an experience that will turn your idea of what a museum is on its head! 21 acres comprise this fusion of zoo, botanical garden, art gallery, and natural history museum. 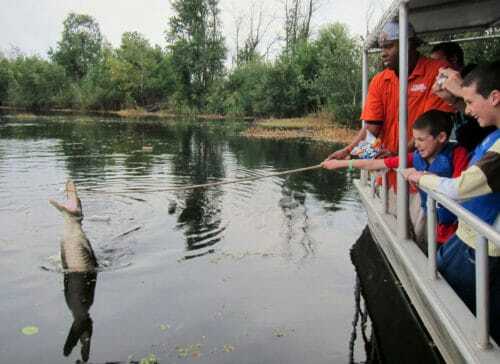 We visited there with the kids and it was a huge success. So where can you find it all? I hope you enjoyed our Arizona Bucket list! Leave me a comment to let me know if you ever visited any of these places or if you have additional places to suggest.